Last fall, Random Acts supporter Ana Fuentes was inspired to perform a kindness act. She also wanted children to actively participate in the project. Along with giving back to the community, she desired to help foster valuable team building skills and nurture the interest in children to volunteer. Ultimately, her hope was that children who help their community now, would be more encouraged to engage in kindness acts as adults. Ana decided to donate scarves to the Little Lambs Foundation for Kids, a nonprofit organization based in Logan, Utah. Throughout the year, Little Lambs assembles comfort packages and delivers them to youth in foster care. But Ana didn’t want to donate ordinary winter garments. She wanted to add a little sparkle to the scarves. For that task, she gathered a group of third graders from Los Angeles, California to help. On the day of the event, the students arrived at the venue filled with laughter and eager to get started. 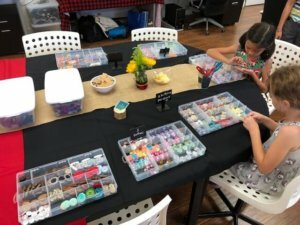 Parent volunteers helped to arrange the craft materials and set-up a series of workstations. The children chose from an array of yarn, colorful buttons, shiny ribbons, and dozens of crayons. They moved dutifully from supply table to the next, collaborating as a team and helping each other when necessary. Cheerful smiles filled the room as the children finished sprucing up their projects. 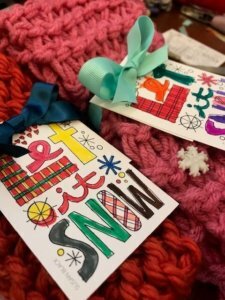 Finally, as an extra sprinkle of kindness, the children wrote personal messages on gift tags and attached them to the scarves. In total, the students decorated sixty items. Ana sent the scarves to Little Lambs shortly after the event. She was very happy with the way the day turned out. In fact, she began thinking of ways to host another kindness activity. Want to Start Your Own Kindness Act? Let Random Acts help. Check out ways to perform your own act of kindness for more information.